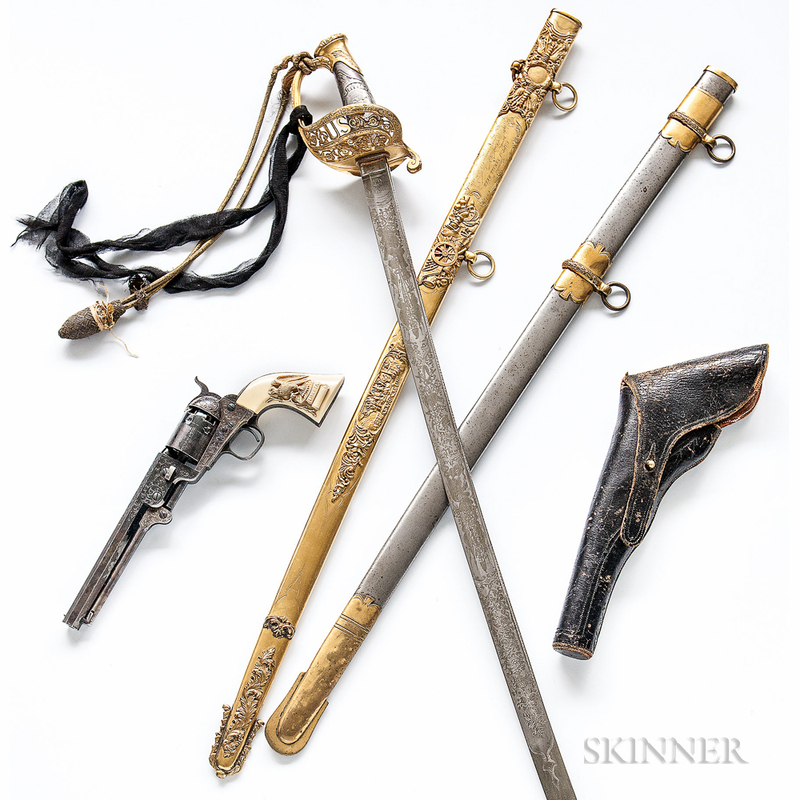 Martial Artistry: Skinner Offers Noteworthy Historic Arms & Militaria Auction, October 26 | Skinner Inc. 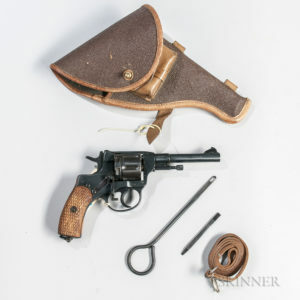 This auction is distinguished for the number, variety and quality of Civil War weapons offered. One of the most notable such arms to come to auction is the 1st DC Cavalry Henry Rifle (Lot 262, estimated between $150,000-200,000). This iconic weapon was captured by the Confederate General Wade Hampton during the successful Beefsteak Raid of 1864. Hampton gave the gun to his adjutant, Major Henry B. McClellan, in whose family it has descended. The rifle, which bears “W Hampton” scratched into the top of the frame, is accompanied by a letter of commendation for McClellan, hand-written and signed by Robert E. Lee and with its original envelope and a signed photograph of McClellan during his service as Lieutenant/adjutant of the 3rd Virginia Cavalry. Other poignant relics of the Civil War are Captain James Sewall Reed’s Presentation Revolver, Holster and Sword (Lot 168, $30,000-50,000. These items were presented to Reed by the San Francisco Dragoons, of which he was the first captain. Reed left California in 1863 at the head of a company of cavalry volunteers (the California Hundred) to serve with the 2nd Massachusetts Cavalry. Reed and his men went into combat in Virginia, where he was killed in 1864. His body and the artifacts in this lot were returned to his native state of Massachusetts. The sword grip still is entwined with the black crepe placed on it for his funeral. Mementos of war are not limited to weapons. A brass-fitted walnut case opens to reveal not pistols or papers, but an Identified Surgeon’s Medical Kit (Lot 161, $8,000-10,000), related to Lincoln Ripley Stone. He was the surgeon of Col. Robert Gould Shaw’s 54th Massachusetts Volunteer Infantry, the famed black regiment that became the subject of the film Glory. 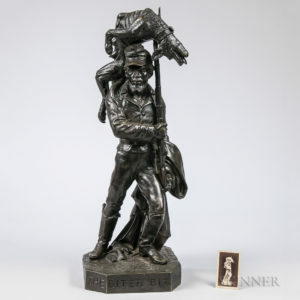 Another affecting reminder of African-American participation in the Civil war is a bronze sculpture titled “The Biter Bit” by Karl Muller, circa 1864 (Lot 134, $3,000-5,000). The piece shows an African-American soldier with a dead bloodhound impaled on his bayonet. It is a grimly graphic reference to the Confederate Army’s use of dogs to attack African-American troops, as they had formerly been used to track down escaped slaves. The Battle of Chickamauga War Log (Lot 188, $14,000-16,000) is a mute yet eloquent battlefield survivor. This 40-inch-long section of tree trunk tells its own story, with two six-pound solid shot and several artillery fragments embedded in it. Many meeting halls of the Grand Army of the Republic, a veterans’ organization which thrived mainly in the northern states in the post-Civil War years, proudly displayed these relics to commemorate their members’ service. 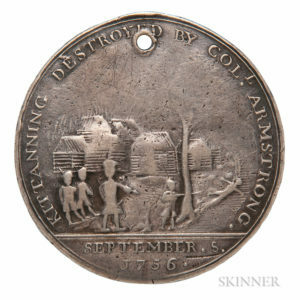 Silver “Kittanning Destroyed” Medal, ca. 1756 (Lot 42, $4,000-6,000). The first medal struck in the colonies, it commemorates an incident in the French and Indian Wars. Colonel John Armstrong raided the village, the headquarters of the Delaware Indians. The battle was considered an important victory for the Pennsylvania Provincial troops. Cheesebox canteen ca. 1776 (Lot 107, $3,000-5,000). This pine-sided canteen, carved with the name JOSEPH ELIOT and the date 1776, belonged to a Revolutionary War soldier who marched on the Lexington alarm and fought at the Battle of Saratoga. 1812 Silver Captain Isaac Hull Medal (Lot 54, $25,000-35,000). This medal was presented to officers of the U.S.S. Constitution who participated in the successful battle against the British frigate Guerriere. This example, in its original presentation case, was awarded to then Lieutenant George C. Read, who later became the captain of the Constitution. The sale concludes with an international assortment of post-1898 firearms. The purchase of these requires a Federal Firearms License. Interested bidders for Lots 280 to 337 should contact William Madden at 508-970-3266 for further information. Concurrent with the Historic Arms & Militaria live auction Skinner, Inc. will hold an auction of Militaria online featuring pistols and muskets, historic documents, and antique arms from the time of the American Revolution through World War II. Items on offer include artillery, swords, pistols, powder horns, uniforms, muskets, and rifles. The online-only sale will begin on October 18, 2017 at 12PM and will conclude on October 27, 2017 at 2PM. This entry was posted in News and tagged 20th century firearms, artillery, cannons, Civil War, early medieval throwing axe, historic arms, historic militaria, iron armor, marlborough, muskets, pistols, powder horn, powder horns, rare militaria, rifles, skinner, skinner auctions, swords, uniforms, world war II by Skinner. Bookmark the permalink.